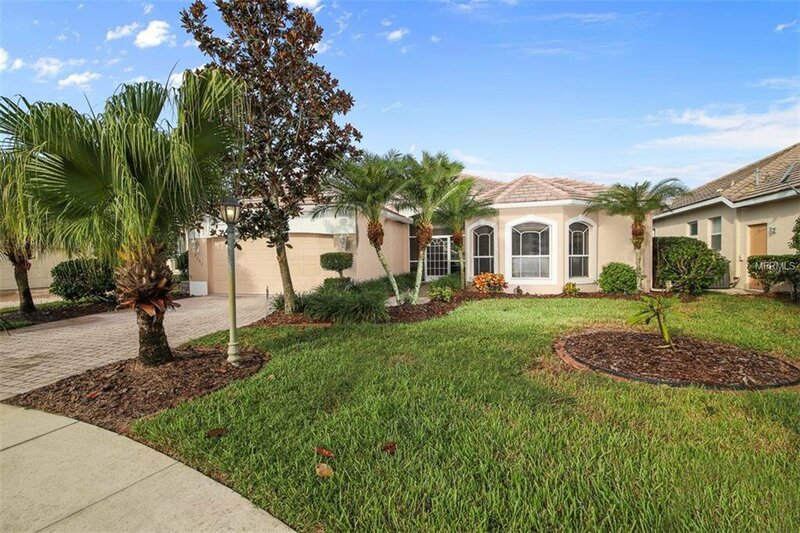 Great cozy 2/bed 2/bath plus den pool home with a wonderful view of the Charlotte Harbor National Golf Course at Bobcat Trail. As you enter this home through the beautiful 8’ wood and glass doors you will notice the disappearing 90 degree sliding doors, that open to a wonderful large pool area with stamped concrete decking. This great room style home offers a split floor plan, beautiful wood-like tile throughout the living areas, new carpet in Master bedroom, and Den, built-in book shelves, quartz counter tops in the kitchen and both bathrooms, with newer stainless-steel appliances including a double oven. The outside of the home, and the living area inside were recently painted. You do not need to be a member of the golf course to enjoy the many amenities that Bobcat Trail has to offer, such as a large heated community pool, a fitness center, tennis, pickleball, and a large community center where many activities take place. Bobcat is conveniently located near I-75 and US 41. There is also medical care, shopping, and restaurants close by. The beach is only 30 minutes away!